ðŸ˜¯ Bold move, I know. Note: I held off on writing this post for a good 4 months because I wanted to have some proper insights backed up by data to share. Now I do, so here it is! First, let's walk down memory lane and I'll explain how the idea to double prices came up in the first place. I offer something pretttty different in the web design world. Most designers take on 4-5 clients at a time and site build and launch tends to take 2-3 months. It's also pretty common for timelines to go long, and for site launches to take weeks or sometimes even months more than the original estimate. Revisions to the site are limited to generally 2-3 rounds. 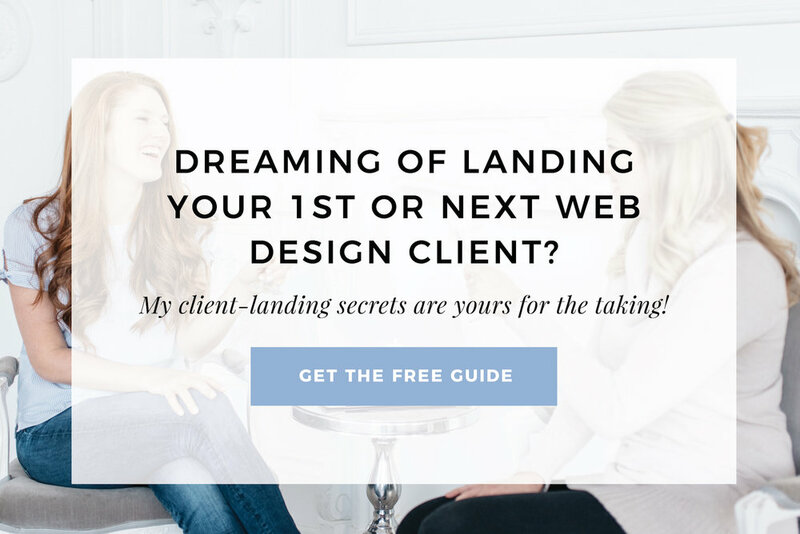 I take on just one client at a time and take them from site dreaming to site launching in 2 weeks. Sites are always completed on time. My client get the undivided attention of their own dedicated designer for 2 weeks, and I get to pour all of my focus into just one clients project. I give my clients unlimited rounds of revisions and also follow up every site design with an individualized lesson. I help them with linking up external integrations and am there holding their hand to launch the thing too! This process is pretty unique, and is LOVED my by clients. "I'm just so happy to have completed this huge piece of my business plan in 2 weeks!" Even with this major value add in both my process and the additions I include in my packages that others don't, I had been previously pricing similar to that of the other designers out there. Until I had a phone call with a business friend who knocked a bit of sense into me. My friend worked in a company that helped hundreds of business owners launch websites, so he's pretty familiar with the web design space and my business. He let me know that I was offering truly incredible value for the price, maybe even too much value for the price, and challenged me to double my prices. On the call I was thinking 'no way!' ... Off the call the thought was firmly planted in my head and it began to grow. I began researching and comparing my packages, designs and pricing to others in my industry. I realized he was absolutely right. My value vs. price was completely off. I toyed with the idea of raising prices by $1,000. Or raising them a bit now and a bit more in the future until I got to the doubled price as he suggested. But, it's uncomfortable enough to raise prices once, let alone do it every few months. I wanted my price to be something I was happy with for the foreseeable future. I ended up deciding to take the full leap. I hadn't heard of anyone similar doubling prices before, so it was a gamble as I had no idea what to expect. What does happen when you double prices? Will my followers and email list be turned off by it? Will past clients who refer new clients to me stop because the price is twice what they had paid? I did however know that the pricing was definitely off from what it should have been, and postponing the uncomfortable decision of upping them wasn't going to get me anywhere. In an hour of the call, with a feeling of 'yes! this is right!' I doubled the prices on my site. I doubled the prices within an hour of my call, but wanted to give the opportunity to anyone who had been sitting on the fence to still get in at my old prices. I also emailed each of the booking inquiries I had in the past who hadn't yet booked in, which resulted in a booking. Off to a good start already! Alright, I know that the big question is, did my inquiries and bookings take a nosedive? In my weekly stats tracking, I note down how many booking inquiries and how many bookings I did that week and month. Therefore, I could track the difference pre and post price increase, and have specific numbers to back up wether or not this was a good decision. Before I did the increase, I decided on what would be a success. If inquiries and bookings dropped in half, but I made twice per project, then I'd be making the same and working half the time. I'd call that a win. So basically anything over getting half the bookings and inquiries was a success. As it turns out, my inquiries and bookings held steady, in fact I saw a slight increase in them. I also booked a client at the new prices later the same week I raised them. There's one major change I've noticed since upping the prices that I think anyone who's considering a price increase should think about. The potential clients you will receive inquiries & bookings from will be different. I've pretty much priced myself out of working with people who are side hustling or who are getting starting in business at the very early stages. All the inquiries I've received post-price change have been from people who have been running their business for some time. They're seeing a lot of success in their business and are looking to get a site that matches their killer business. Through this experience, I learned that as your price changes, that clients you attract will too. And in order to see success in the price change, it's important our sites appeal to our new clients. The messaging of your site should change with a price change! For the most part, I've priced myself out of the 'side hustler,' 'passion project' entrepreneurs. I previously had a line in my sales page mentioning something about 'leaving a 9-5,' but with the new prices, I would basically only be attracting people who had already left their 9-5. As such, that line had to go. That's just one example, but I hope it demonstrates a larger take away. When your price changes, your ideal clients will change, and therefore your site likely will need some tweaks to properly communicate with your new people. Why did my inquiries and bookings not dry up? If I upped my prices to $150,000 for a 10 page Squarespace website, I'm quite sure I would have 0 inquiries in my inbox, but that's not the case. I'm far from the most expensive web designer out there. I haven't by any means hit the ceiling of what business owners are willing to pay for a website. My inquiries and bookings didn't dry up because there are all types of buyers out there. There's buyers to whom price is the most important factor. But there's also buyers out there to whom convenience, or trust or design style is the most important, and the price really is irrelevant if the service solves their problem and gets them what they want. Both higher and lower price points will attract some and deter others. I sold my first website design for $680, now they're $5,000. I don't think there's any chance a current client of mine would have consider hiring me if my prices were still $680. When you're an established business owner who's poured your blood, sweat and tears into growing your business and you're ready to reinvest, you want it done well and done by an expert. You want someone who knows what they're doing and has a proven record of great work. You're expecting to pay for it, in fact, you're happy to do so, because you know that the investment will help grow your business. And to be honest, you'll be scared off of bargain basement prices, because it'll make you question the quality of the design and the service you'll receive. So to wrap up, I'm not encouraging doubling prices just for the heck of it, but if you have a feeling that your value and pricing aren't aligning then I absolutely encourage you to give it a think, research your market and if it feels right, take the leap! And of course don't forget that if you're considering upping prices just know that the clients you'll be attracting will change, therefore your site should also change with a significant price change so it communicates well with your new people well!